Spike Jones and the City Slickers (featuring Freddie Morgan) performing the Poet and Peasant Overture. David Letterman would have a hard time proving that he created the "Top Ten List" to Detroit area kids! 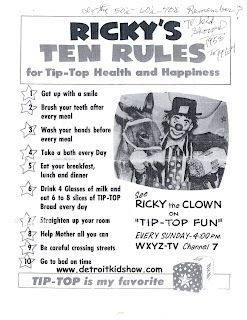 Here we see Irv "Ricky" Romig's Top Ten Rules for Tip Top Health and Hapiness (his television sponsor were the folks at "Tip Top Bread") that Ricky himself brought down from Mt. Sinai. 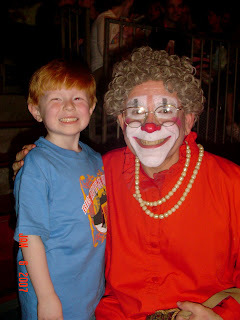 Clownalley.net is proud to announce the creation of the Frank B. Adler Awards for Excellence in American Circus Clowning. Never before have active American circus clowns had the opportunity to be recognized for work by both their audience and their peers. The Felix B. Adler Awards are granted by the American Academy of Clown Arts and Sciences, a professional honorary organization, which will be voted on by both Academy members (75% of overall score) as well as the general public (25%). The votes will be tabulated and certified by the independent auditing firm, Intelligroup. 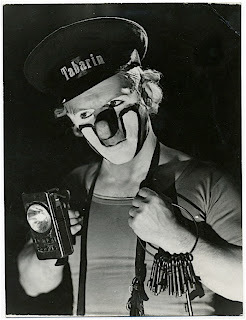 The awards are intended to honor the performers that the Academy believes have made particularly memorable contributions in the field of American circus clowning in the previous calendar of the year. The 2007 virtual awards ceremony, the 1st ever, will take place on February 04, 2007, online at clownalley.net during the halftime of Super Bowl XLI and will be hosted by blogger Pat Cashin. Votes for the awards will be accepted starting January 23, 2007, 5:30 a.m. PST (1:30 p.m. UTC) and will be accepted and right up until Super Bowl kickoff time. 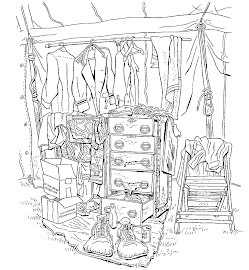 The Academy hopes to make the "Felixes" an annual presentation. Academy membership may be obtained by a competitive nomination (however, the nominee must be invited to join) or a member may submit a name. The Academy does not publicly disclose its membership. 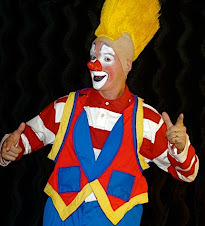 A nominee has to have clowned with a circus sometime in the previous calendar year (from midnight at the start of January 1 to midnight at the end of December 31) in the United States of America, to qualify. 2007 nominees must actually perform in the ring to qualify for an award (future awards are planned for Blackouts, Track Gags and Walkarounds). 1) THE OTTO GRIEBLING AWARD FOR SOLO CIRCUS CLOWNING: A circus clown working alone, with a ringmaster, stooge or with audience volunteers. 2) THE PAUL JUNG AWARD FOR CLOWNING PARTNERSHIPS OR ENSEMBLES: Two or more circus clowns working together, with a ringmaster, stooge and/or with audience volunteers. 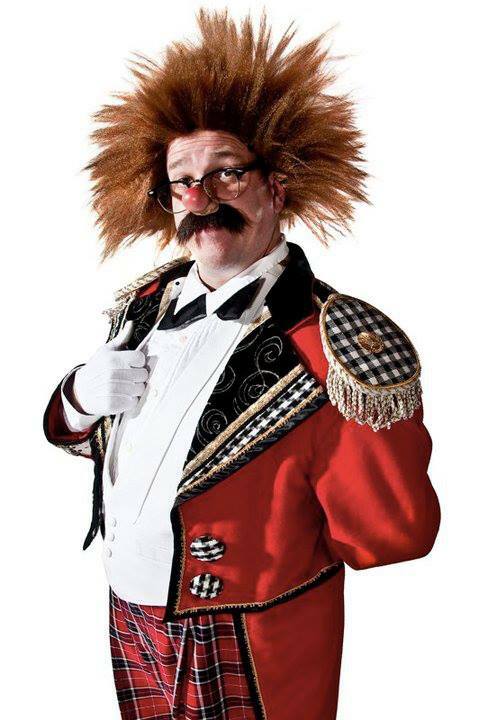 3) THE LOU JACOBS LIFETIME ACHIEVEMENT AWARD: Awarded for a lifetime's work dedicated to the advancement of American circus clowning. Where and how to cast your votes will be announced January 22, 2007. A late 60s/early 70s Ringling photo of Chilean comedy powerhouse Mike Padilla taking a stroll down the track past what looks like Lazlo Donnert's one man band. It may be Tomi Liebel but those look like Lazlo's sideburns to me. And if that's Lazlo then it's pretty safe to assume that his partner is his pal Dougie Ashton on trumpet. Why does a one man band need a partner? It's like jazz, if you have to ask you'll never know. 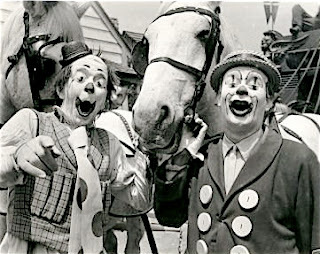 Abe Goldstein (l) sans his usual "clown cop" attire and Eddie "Spaghetti" Emerson (r) in a publicity still from the 1960 Walt Disney film "Toby Tyler". Charlie Rivel in a publicity still from his 1943 film "Akrobat Schooon!" 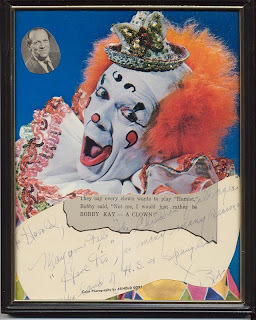 Further evidence that Carol Burnett's crippling coulrophobia (which in Diane Keaton's book CLOWN PAINTINGS she claims to have had since childhood) is a recent invention of hers. 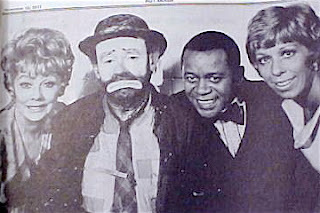 Here she is seen with Lucille Ball, Flip Wilson and Emmett Kelly, who was a guest on her show, in a Shrine Circus program photo. She looks fine to me. 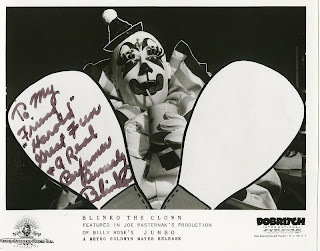 I was reminded the other day that Carol had no problem with clowns when she was presented with a honorary degree from Clown College by Peggy Williams during the Q & A opening of an episode of her variety show. Say hey, it's Bobby Kay! Another of the photos that have surfaced since the Ronk Estate auction. 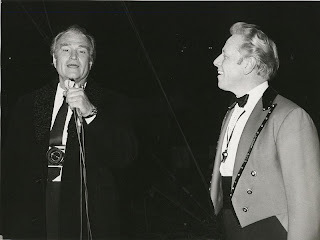 Here's Harold Ronk with "One of America's Clowns" (not "America's Greatest Clown", not "America's Funniest Clown nor "America's Favorite Clown"... always simply "One of America's Clowns") the one and only Red Skelton. Good night and may God bless. 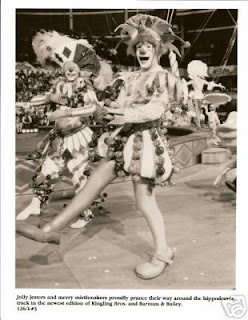 Anthony Yeo in a press photo for Ringling's 124th Edition Blue unit show. 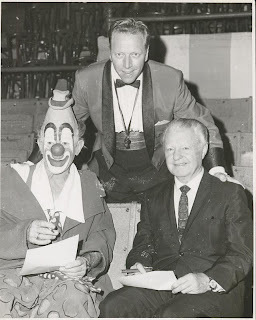 Here we have Mr. Ronk, Rudy Bundy and legendary Ringling Master Clown Lou Jacobs at a PR event: judging a clown contest at the Boston Garden June 5th 1967. 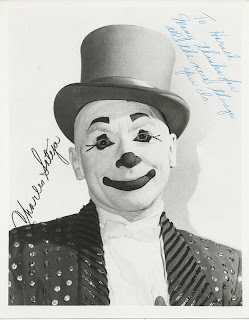 More from the Ronk estate: the classic neat whiteface of Chuck Sateja. An Al Dobritch publicity photo of Ernie "Blinko" Burch. 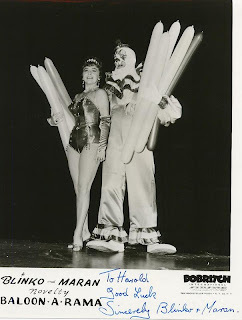 Another Al Dobritch publicity photo for Ernie "Blinko" Burch and his wife Maran's Balloon-a-rama show, a fixture on the Dobritch Shrine circuit as well as Circus-Circus in Las Vegas. Shane and I also extend a belated thank you to Christopher "Hoot" Hudert for a wonderful dinner recently ( and another one where Shane was a little four year old thorn in daddy's side as the grown ups tried to talk clowning) where Hoot regaled me with tales of his years on the road and his time as Boss Clown in the pre-Larible era. Please click the title of this post for more info on Christopher and his company, Applause Unlimited. Big Apple Circus: Step Right Up! 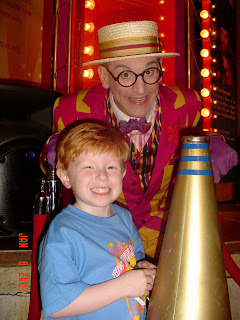 My son Shane and I had a wonderful evening last night at the Big Apple Circus during it's final weekend in Lincoln Center. We ran into some old friends, met some new ones and had a mini-Clown College reunion as Barry Lubin and Joel Jeske were appearing in a show directed by Steve Smith (not in attendance) and my CC roommate for the summer of '97 Ambrose Martos was working the VIP area of the reception tent. Shane went absolutely nuts when Grandma made her entrance last night, hooting, cheering and waving his Grandma doll over his head. He spent the first 15 minutes or so asking the same question that I did when I first saw this year's show, "Where's Grandma?" It's worth the wait. Shane with host/announcer Joel Jeske. Joel met up with us after for a trip to the diner. Shane was not exactly on his best behavior but he IS only four, was just coming back from a circus and was full of soda, popcorn and cotton candy. Not the best combination if you'd like your kid to sit still and finish his chicken nuggets while the grown-ups talk. Here's a 10 minute video I found on YouTube featuring highlights from this year's show. It doesn't contain much of the clown material, which is probably all for the best...they really need to be seen live! Great work from Barry Lubin, Joel Jeske, Francesco, Johnny Peers and Justin Case under the direction of Steve Smith.